Our range of Ramdarbar Sculptures is widely popular among a huge client base. The range is crafted by seasoned designers and is available in exquisite models and sizes. We offer the array as per client specifications at best industry prices. Our range of Ram Darbar comprises a set of sculptures Ram, Laxman and Sita and the additional sculpture of Hanuman ji. These statues are painted and colored well by skilled hands that finish this delicate artwork. The range is acclaimed for its delicate beauty and calm portrayal of the statues. These are available in the market at competitive rates. 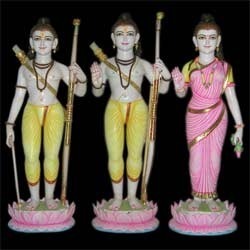 Our range of Ram Ji Sculptures is widely popular among the clients for its beauty and elegance. These sculptures are made by a team of skilled artisans and craftsmen. The sculptures are crafted using quality clay and materials to etch out beautiful and good looking features. The range is colored in golden, pink, and other attractive colors. Clients can avail this range from us at very nominal prices. 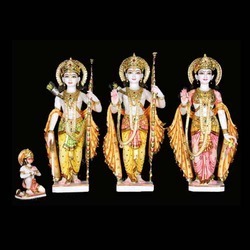 Our company offers a full set of Ram Darbar where we offer sculptures of Ram, Laxman and Sita. These are designed and have a flat bottom for perfect placing. All the three sculptures are independent and can be set as required by the customer. Our products are widely acclaimed for there beautiful craftsmanship and artistic looks. These are widely available in the market at reasonable rates. 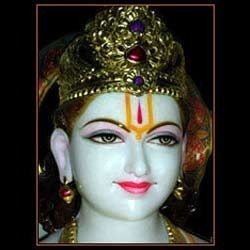 Looking for Ramdarbar Sculptures ?